In this article, we will understand what are streams and why we need them? 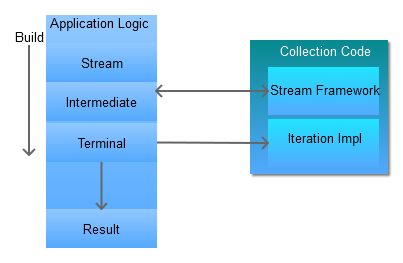 The best way to understand streams is to review an example that involves processing a list. For example, picking up the top 3 action movies from a list of movies provided to you. The usual way before the introduction of streams was to iterate over the list, do some work on each element to figure out whether the element fits the criteria and then continue with the next element, if available, till we reach end of the list. We will know it when iterator.hasNext() returns us false. We were provided with a list of movies, we needed to filter them by ‘ACTION’ genre, sort the list by its rating, get the top 3 movies, their names and print each one of them. Let’s analyse the stream API used. Iteration and application logic that work on the individual elements are two different concerns. Streams aim at decoupling both these concerns. In the below diagram, we show that in the pre-stream world, the iteration was handled in the application code by the user using for-each or Iterator. The logic of traversing the elements is intermingled with the functionality that is applied to each element in the sequence and the actual intent of the application logic that works on these iterated elements gets diluted in the boilerplate code around it. Separating the concerns would allow for optimizations regarding how the elements are accessed. With the introduction of streams, the ‘What’ and ‘How’ are decoupled. ‘What’ represents the criteria that we want to build and ‘How’ represents the execution of the criteria which is now handled completely by the framework. Stream API aims at further decoupling the ‘What’ part by structuring the API into two parts. This eases the way user builds the criteria and actual execution of criteria is only handled in the end. stream – call stream on the data source like list, array, map etc. Terminal operation – this is the final operation that triggers the iteration and processes the stream pipeline to return a result. The last steps control the details of the iteration process. This is called internal iteration. Before I conclude this article, I will leave you with some more examples on stream. Here is the Movie bean. It also contains method getMovieList() to return a sample of movies on which we will run our examples. System.out.println("-Does the movie list have rating >= 9.0?-"